Daryl Kreindel, an accomplished quilt maker, is a devoted MGH Fund supporter. Through a gift to the MGH Fund, an avid quilter expands her long-time support for the hospital that has been a source of care, inspiration and comfort for her family. 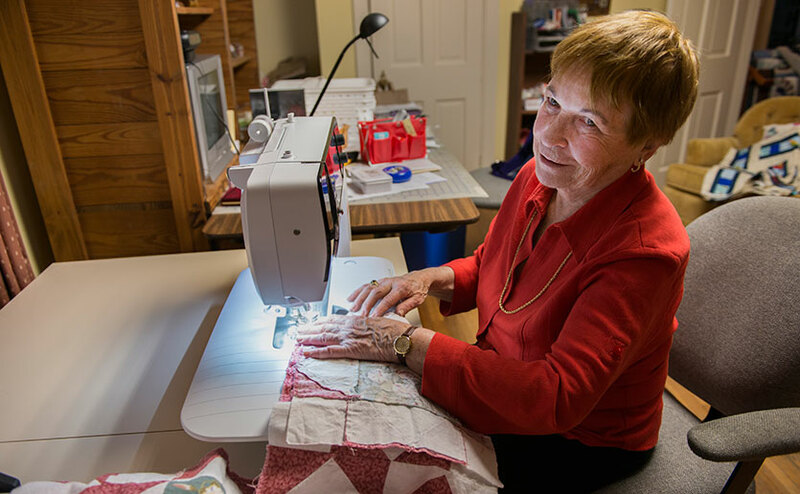 Just as she sews multicolored quilts for children and adults in need, Daryl Kreindel is stitching together a legacy of giving in honor of the decades of compassionate care she and her late husband, Burt Kreindel, experienced at Massachusetts General Hospital. Daryl Kreindel prepares quilts to donate to those in need at Mass General. Through a gift to the MGH Fund that first pays her income in retirement, the avid quilter is expanding her long-time support for the hospital that has been a source of care, inspiration and comfort for her family. The MGH Fund provides unrestricted support for the hospital’s most urgent and innovative projects. They include up-and-coming research, innovative technologies and state-of-the-art clinical centers and groundbreaking global health programs in places where they are needed. The MGH Fund also supports programs that give patients access to the latest advanced technologies, clinical trials and promising treatments. The Kreindels’ relationship with Mass General began nearly 60 years ago, when Burt began to see a primary care physician at Mass General. Years of good health followed. Then at age 55, just before marrying Daryl, a routine stress test showed Burt had suffered a small heart attack sometime in the past. Undeterred and under the compassionate care of Mass General physicians, Burt and now Daryl were determined to live life fully. And they did. Burt worked full time at Mitre Corporation and maintained a part time law practice in Newton while Daryl worked as a computer programmer in the mutual funds industry. They camped regularly in the White Mountains and enjoyed the theater. At 70, Burt began to experience indigestion and breathlessness — classic symptoms of cardiac distress. His doctor ordered a stress test. Minutes before it, Burt suffered a major heart attack at the Mass General testing facility — a fortunately short distance from the Emergency Department. “They saved his life and gave him 20 more years,” Daryl says. The MGH Fund provides unrestricted support for the hospital’s most urgent and innovative projects. Daryl and Burt made the most of that gift — still hiking and traveling. Working with his Mass General cardiologist, Claudia Chae, MD, Burt thrived on a heart-healthy diet and exercise plan. “People didn’t believe that he was in his 80s,” Daryl says. During those years, the couple deepened their relationship with Mass General, grateful for the compassionate care they received. They became involved in The 1811 Society, a special giving circle comprised of the MGH Fund’s most generous donors. And they joined the Phillips Society, for those who remember Mass General in their long-term plans. As members, they enjoyed social events and learned about the latest medical breakthroughs in various lectures. “The lectures really gave us the knowledge about what MGH was doing to improve medicine,” Daryl explains. A dozen years ago, Daryl’s love for quilting led her to join a group of Mass General volunteers who meet monthly to create quilts for patients — from newborns in intensive care to adults undergoing chemotherapy. No two teacups are alike in this quilt by Daryl Kreindel. Last year, at age 90, with Daryl by his side, Burt died from cardiac arrest while en route to Mass General. Though he had slowed physically in the past year, he remained mentally active, keeping up with technology, politics and his beloved grandson. “He liked crossword puzzles and writing letters to the New York Times,” Daryl recalls, noting that several of his letters were published. Her quilting with the Mass General volunteers remains a way to pass on the kindness she experienced in her own life. “People helped me along the way. It makes me feel good that I’m giving back,” Daryl says. “To me a quilt is a colorful selection of fabrics that will cheer somebody up.” Her Mass General quilting group came to Burt’s funeral and sent cards. After Burt’s death, Daryl, now 75, established a gift annuity to represent her long-range support for the hospital. “I trust MGH to use it responsibly,” Daryl says. For more information about planned giving and the MGH Fund, please contact us.